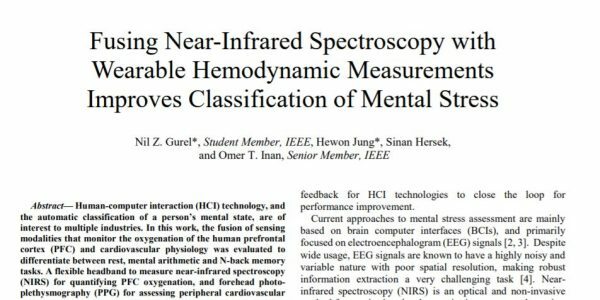 N. Z. Gurel, H. Jung, S. Hersek, and O. T. Inan, “Fusing Near-Infrared Spectroscopy with Wearable Hemodynamic Measurements Improves Classification of Mental Stress,” IEEE Sensors Journal, In Press. M. M. H. Shandhi, B. Semiz, S. Hersek, N. Goller, F. Ayazi, and O. T. Inan, "Performance Analysis of Gyroscope and Accelerometer Sensors for Seismocardiography-Based Wearable Pre-Ejection Period Estimation," IEEE Journal of Biomedical and Health Informatics, In Press. M. R. Ahmed, Y. Zhang, Z. Feng, B. Lo, O. T. Inan, and H. Liao, "Neuroimaging and Machine Learning for Dementia Diagnosis: Recent Advancements and Future Prospects," IEEE Reviews in Biomedical Engineering, In Press. 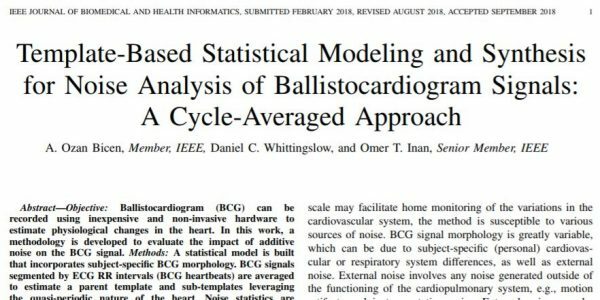 A. O. Bicen, D. Whittingslow, and O. T. Inan, "Template-Based Statistical Modeling and Synthesis for Noise Analysis of Ballistocardiogram Signals: A Cycle-Averaged Approach," IEEE Journal of Biomedical Health Informatics, In Press. H.-K. Jeong, D. Whittingslow, and O. T. Inan, “b-Value: A Potential Biomarker for Assessing Knee Joint Health using Acoustical Emission Sensing,” IEEE Sensors Letters, v. 2, no. 4, pp. 1-4. 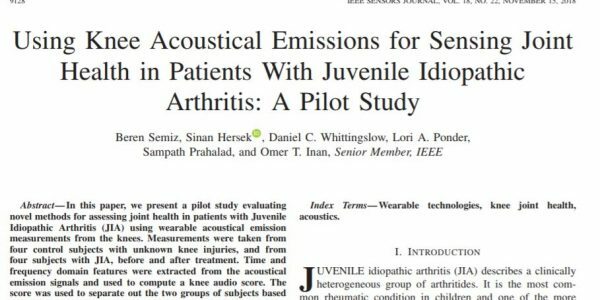 B. Semiz, S. Hersek, D. Whittingslow, L. Ponder, S. Prahalad, and O. T. Inan, “Using Knee Acoustical Emissions for Sensing Joint Health in Patients with Juvenile Idiopathic Arthritis: A Pilot Study,” IEEE Sensors Journal, v. 18, no. 22, pp. 9128-9136, 2018. T. Wehbe, V. J. Mooney, O. T. Inan, and D. C. Keezer, “Securing Medical Devices Against Hardware Trojan Attacks Through Analog, Digital and Physiological Based Signatures,” Journal of Hardware and Systems Security, v. 2, no. 3, pp. 251-265, 2018. Z. Xia, M. M. H. Shandhi, O. T. Inan, and Y. Zhang, “Non-Contact Sensing of Seismocardiogram Signals Using Microwave Doppler Radar,” IEEE Sensors Journal, v. 18, no. 14, pp. 5956-5964, 2018. 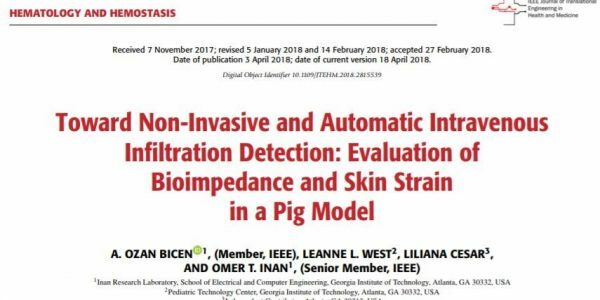 A. O. Bicen, L. West, L. Cesar, and O. T. Inan, “Toward Non-Invasive and Automatic Intravenous Infiltration Detection: Evaluation of Bioimpedance and Skin Strain in a Pig Model,” IEEE Journal of Translational Engineering in Health and Medicine, v. 6, 2018. B. Henley, M. Shokouhi, A. Mahajan, O. T. Inan, and I. Hajjar, “Cardiovascular response to mental stress in mild cognitive impairment and its association with cerebral perfusion,” Journal of Alzheimer’s Disease, v. 63, no. 2, pp. 645-654, 2018. C. S. Kim, A. M. Carek, O. T. Inan, R. Mukkamala, and J.-O. Hahn, “Ballistocardiogram-Based Approach to Cuff-Less Blood Pressure Monitoring: Proof-of-Concept and Potential Challenges,” IEEE Transactions on Biomedical Engineering, In Press. S. Hersek, M. Baran Pouyan, C. N. Teague, M. N. Sawka, M. L. Millard-Stafford, G. F. Kogler, P. Wolkoff, and O. T. Inan, "Acoustical Emission Analysis by Unsupervised Graph Mining: A Novel Biomarker of Knee Health Status," IEEE Transactions on Biomedical Engineering, v. 65, no. 6, pp. 1291-1300, 2018. H.-K. Jeong, M. Baran Pouyan, D. C. Whittingslow, V. Ganti, and O. T. Inan, “Quantifying the Effects of Increasing Mechanical Stress on Knee Acoustical Emissions Using Unsupervised Graph Mining,” IEEE Transactions on Neural Systems and Rehabilitation Engineering, v. 26, no. 3, pp. 594-601, 2018. O. T. Inan, D. C. Whittingslow, C. N. Teague, S. Hersek, M. Baran Pouyan, M. Millard-Stafford, G. F. Kogler, and M. N. Sawka, "Wearable Knee Health System Employing Novel Physiological Biomarkers," Journal of Applied Physiology, v. 124, no. 3, pp. 537-547, 2018. M. Etemadi and O. T. Inan, "Wearable Ballistocardiogram and Seismocardiogram Systems for Health and Performance," Journal of Applied Physiology, v. 124, no. 2, pp. 452-461, 2018. H. Ashouri, S. Hersek, and O. T. Inan, "Universal Pre-Ejection Period Estimation using Seismocardiography: Quantifying the Effects of Sensor Placement and Regression Algorithms," IEEE Sensors Journal, vol. 18, no. 4, pp. 1665-1674, February 2018. O. T. Inan, M. B. Pouyan, A. Q. Javaid, S. Dowling, M. Etemadi, A. Dorier, J. A. Heller, A. O. Bicen, S. Roy, T. De Marco, L. Klein, “Novel Wearable Seismocardiography and Machine Learning Algorithms can Assess Clinical Status of Heart Failure Patients,” Circulation: Heart Failure, vol. 11, no. 1, pp. e004313, January 2018. C. Zhang, A. Waghmare, P. Kundra, Y. Pu, S. Gilliland, T. Ploetz, T. E. Starner, O. T. Inan, and G. D. Abowd, “FingerSound: Recognizing unistroke thumb gestures using a ring,” Proceedings of the ACM on Interactive Mobile, Wearable, and Ubiquitous Technology (IMWUT), v. 1, no. 3, 2017. A. M. Carek, J. Conant, A. Joshi, H. Kang, O. T. Inan, “SeismoWatch: Wearable Cuffless Blood Pressure Monitoring using Pulse Transit Time,” Proceedings of the ACM on Interactive Mobile, Wearable, and Ubiquitous Technology (IMWUT), v. 1, no. 3, 2017. N. B. Bolus, C. N. Teague, O. T. Inan, and G. F. Kogler, “Instrumented Ankle-Foot Orthosis (iAFO): Towards a Diagnostic Tool for Patient-Specific Optimization of Orthotic Stiffness,” IEEE/ASME Transactions on Mechatronics, v. 22, no. 6, pp. 2492-2501, 2017. 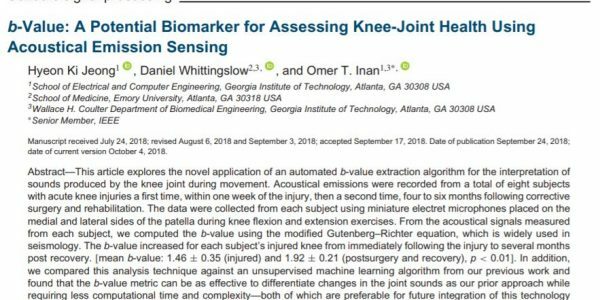 S. Hersek, C. N. Teague, M. L. Millard-Stafford, H.-K. Jeong, M. Bavare, P. Wolkoff, M. N. Sawka, and O. T. Inan, “Wearable Vector Electrical Bioimpedance System to Assess Knee Joint Health,” IEEE Transactions on Biomedical Engineering, vol. 64, no. 10, pp. 2353-2360, October 2017. A. M. Carek and O. T. Inan, “Robust Sensing of Distal Pulse Waveforms on a Modified Weighing Scale for Ubiquitous Pulse Transit Time Measurement,” IEEE Transactions on Biomedical Circuits and Systems, vol. 11, no. 4, pp. 765-772, August 2017. A. O. Bicen, N. Z. Gurel, A. Dorier, and O. T. Inan, “Improved Pre-Ejection Period Estimation from Ballistocardiogram and Electrocardiogram Signals by Fusing Multiple Timing Interval Features,” IEEE Sensors Journal, vol. 17, no. 13, pp. 4172-4180, July 2017. C. Zhang, Q. Xue, A. Waghmare, S. Jain, Y. Pu, J. Conant, S. Hersek, K. Lyons, K. A. Cunefare, O. T. Inan, and G. D. Abowd, "SoundTrak: Continuous 3D tracking of a finger using active acoustics," Proc. of the ACM on Interactive Mobile, Wearable, and Ubiquitous Technology (IMWUT), vol. 1, no. 2, article no. 30, June 2017. H. Ashouri, and O. T. Inan, “Automatic Detection of Seismocardiogram Sensor Misplacement for Robust Pre-Ejection Period Estimation in Unsupervised Settings,” IEEE Sensors Journal, vol. 17, no. 12, pp. 3805-3813, June 2017. A. Q. Javaid, H. Ashouri, M. Etemadi, J. A. Heller, S. Roy, and O. T. Inan, “Quantifying and Reducing Motion Artifacts in Wearable Ballistocardiogram Measurements during Walking to Assess Left Ventricular Health,” IEEE Transactions on Biomedical Engineering, vol. 64, no. 6, pp. 1277-1286, June 2017. A. D. Wiens, A. Johnson, and O. T. Inan, “Wearable Sensing of Cardiac Timing Intervals from Cardiogenic Limb Vibration Signals,” IEEE Sensors, v. 17, no. 5, pp. 1463-1470, March 2017. C. Zhang, S. Hersek, Y. Pu, T. E. Starner, G. D. Abowd, and O. T. Inan, "Bioacoustics-based human body mediated communication," IEEE Computer, v. 50, no. 2, pp. 36-46, February 2017. S. L.-O. Martin, A. M. Carek, C.-S. Kim, H. Ashouri, O. T. Inan, J.-O. Hahn, and R. Mukkamala, “Weighing Scale-Based Pulse Transit Time is a Superior Marker of Blood Pressure than Conventional Pulse Arrival Time,” Scientific Reports, v. 6, 2016. C.-S. Kim, S. Ober, M. S. McMurtry, B. Finegan, O. T. Inan, R. Mukkamala, and J.-O. Hahn, "Ballistocardiogram: Mechanism and Potential for Unobtrusive Cardiovascular Health Monitoring," Scientific Reports, v. 6, 2016. H. Toreyin, H.-K. Jeong, S. Hersek, C. N. Teague, and O. T. Inan, "Quantifying the Consistency of Wearable Knee Acoustical Emission Measurements during Complex Motions," IEEE Journal of Biomedical and Health Informatics, v. 20, no. 5, pp. 1265-1272, 2016. C. Wick, W. Auffermann, A. Shah, O. T. Inan, P. Bhatti, and S. Tridandapani, “Echocardiography as an indication of continuous-time cardiac quiescence,” IOP Physics in Medicine and Biology, v. 61, no. 14, pp. 5297-5310, 2016. C. N. Teague, S. Hersek, H. Toreyin, M. L. Millard-Stafford, M. L. Jones, G. F. Kogler, M. N. Sawka, and O. T. Inan, “Novel Methods for Sensing Acoustical Emissions from the Knee for Wearable Joint Health Assessment,” IEEE Transactions on Biomedical Engineering, v. 63, no. 8, pp. 1581-1590, 2016. H. Ashouri, L. Orlandic, and O. T. Inan, “Unobtrusive Estimation of Cardiac Contractility and Stroke Volume Changes using Ballistocardiogram Measurements on a High Bandwidth Force Plate,” Sensors, v. 16, no. 6, p. 787, 2016. A. Q. Javaid, H. Ashouri, S. Tridandapani, and O. T. Inan, “Examining the Hemodynamic Origin of Ballistocardiographic Forces: Towards Improved Monitoring of Cardiovascular Health at Home,” IEEE Journal of Translational Engineering in Health and Medicine, v. 4, 2016. H. Toreyin, S. Hersek, C. Teague, and O. T. Inan, “A Proof-of-Concept System to Analyze Joint Sounds in Real Time for Knee Health Assessment in Uncontrolled Settings,” IEEE Sensors Journal, v. 16, no. 9, 2892-2893, 2016. S. Hersek, H. Toreyin, and O. T. Inan, "A Robust System for Longitudinal Knee Joint Edema and Blood Flow Assessment Based on Vector Bioimpedance Measurements," IEEE Transactions on Biomedical Circuits and Systems, v. 10, no. 3, pp. 545-555, 2016. M. Etemadi, O. T. Inan, J. A. Heller, S. Hersek, L. Klein, and S. Roy, "A wearable patch to enable long-term environmental, activity, and hemodynamic monitoring," IEEE Transactions on Biomedical Circuits and Systems, v. 10, no. 2, pp. 280-288, 2016. A. D. Wiens, A. M. Carek, and O. T. Inan, "Sternal Vibrations Reflect Hemodynamic Changes during Head-Out Immersion: A Preliminary Demonstration of Underwater Wearable Ballistocardiography," Journal of the Acoustical Society of America Express Letters (JASA-EL), v. 138, pp. EL342-346, 2015. A. Q. Javaid, A. D. Wiens, N. F. Fesmire, M. A. Weitnauer, and O. T. Inan, "Quantifying and Reducing Posture-Dependent Distortion in Ballistocardiogram Measurements," IEEE Journal of Biomedical and Health Informatics, v. 19, no. 5, pp. 1549-1556, 2015. A. D. Wiens, O. T. Inan, "A Novel System Identification Technique for Improved Wearable Hemodynamics Assessment," IEEE Transactions on Biomedical Engineering, v. 62, no. 5, pp. 1345-1354, 2015. C. Wick, J. H. McClellan, O. T. Inan, and S. Tridandapani, “Seismocardiography-Based Detection of Cardiac Quiescence for Cardiac Computed Tomography Angiography,” IEEE Transactions on Biomedical Engineering, v. 62, no. 8, pp. 2025-2032, 2015. A. D. Wiens, M. Etemadi, S. Roy, L. Klein, and O. T. Inan, “Towards continuous, non-invasive assessment of ventricular function and hemodynamics: Wearable ballistocardiography,” IEEE Journal of Biomedical and Health Informatics, v. 19, no. 4, pp. 1435-1442, 2015. O. T. Inan, P.-F. Migeotte, K.-S. Park, M. Etemadi, K. Tavakolian, J. M. Zanetti, I. Funtova, J. Tank, G. K. Prisk, and M. Di Rienzo, “Ballistocardiography and seismocardiography: A review of recent advances,” IEEE Journal of Biomedical and Health Informatics, v. 19, no. 4, pp. 1414-1427, 2015. B. Dura, M. Q. Chen, O. T. Inan, G. T. A. Kovacs, and L. Giovangrandi, “High-Frequency Electrical Stimulation of Cardiac Cells and Application to Artifact Reduction,” IEEE Transactions on Biomedical Engineering, v. 59, no. 5, pp. 1381-1390, 2012. K. Chan, O. T. Inan, S. Bhattacharya, and O. Marcu, “Estimating the speed of Drosophila locomotion using an automated behavior detection and analysis system,” Fly, v. 6, no. 3, 2012. O. T. Inan, D. Park, G. T. A. Kovacs, and L. Giovangrandi, “Non-Invasive Measurement of Physiological Signals on a Modified Home Bathroom Scale,” IEEE Transactions on Biomedical Engineering, v. 59, no. 8, pp. 2137-2143, 2012. K. Pandia, O. T. Inan, G. T. A. Kovacs, and L. Giovangrandi, “Extracting respiratory information from seismocardiogram signals acquired on the chest using a miniature accelerometer,” IOP Physiological Measurement, v. 33, no. 10, pp. 1643-1660, 2012. R. M. Wiard, O. T. Inan, B. Argyres, M. Etemadi, G. T. A. Kovacs, and L. Giovangrandi, "Automatic Detection of Motion Artifacts in the Ballistocardiogram Measured on a Modified Bathroom Scale," Medical and Biological Engineering and Computing, v. 49, no. 2, pp. 213-220, 2011. O. T. Inan, O. Marcu, M. E. Sanchez, S. Bhattacharya, and G. T. A. Kovacs, "A Portable System for Monitoring the Behavioral Activity of Drosophila," Journal of Neuroscience Methods, v. 202, no. 1, pp. 45-52, 2011. M. Etemadi, O. T. Inan, L. Giovangrandi, and G. T. A. Kovacs, "Rapid Assessment of Cardiac Contractility on a Home Bathroom Scale," IEEE Transactions on Information Technology in Biomedicine, v. 15, no. 6, pp. 864-869, 2011. O. T. Inan and G. T. A. Kovacs, "A Low-Noise AC-Bridge Amplifier for Ballistocardiogram Measurement on an Electronic Weighing Scale," IOP Physiological Measurement, v. 31, no. 7, pp. N51-59, 2010. O. T. Inan, M. Etemadi, M. E. Sanchez, O. Marcu, S. Bhattacharya, and G. T. A. Kovacs, "A Miniaturized Video System for Tracking the Locomotor Activity of Walking Drosophila Melanogaster in Space and Terrestrial Settings," IEEE Transactions on Biomedical Engineering, v. 56, no. 2, pp. 522-524, 2009. B. Semiz, M.M.H Shandhi, J. Fan, S. Downling, L. Klein, and O.TG. Inan, "Quantification of Hemodynamic Responses to Diuretic Changes in Patients with Heart Failure Using Ballistocardiogram and Electrocardiogram Recordings", IEEE Biomedical and Health Informatics Conference (BHI), Chicago, IL, 2019. Daniel C. Whittingslow, Lara Orlandic, Talia Gergely, Lori Ponders, Sampath Prahalad, Omer T. Inan, Shelly Abramowicz. Assessment of the TMJ in Juvenile Idiopathic Arthritis Using Acoustic Emissions Generated from Jaw Movements in Two Planes.Poster presentation at the Childhoood Arthritis and Rheumatology Research Alliance (CARRA) 2019 Annual Meeting, Louisville, KY.
Daniel C. Whittingslow, Lara Orlandic, Talia Gergely, Lori Ponders, Sampath Prahalad, Omer T. Inan, Shelly Abramowicz. Acoustic Emission Based Assessment of Temporomandibular Joints, presented at the American Academy of Craniomaxillofacial Surgeons (AACMFS) 2019 Annual Meeting, San Antonio, Tx. B. Semiz, S. Hersek, C. Partida, L. Blazquez, V. Selby, G. Wieselthatler, O. Inan, L. Klein, "Blood-Biomarker-Based Acoustical Feature Selection Improves Overall Classification Accuracy for Pump Thrombosis in Left Ventricular Assist Devices," American College of Cardiology (ACC) Scientific Session, New Orleans, LA, 2019. H.K. Jeong, N. Z. Gurel, H. Kloefkorn, S. Hochman, and O. T. Inan, “Performance of Unobtrusive Detection of High Frequency Heart Rate Variability in Mice using an Instrumented Nest,” IEEE Life Sciences Conference, Montreal, Canada, 2018. D. Whittingslow, H.-K. Jeong, T. Gergely, L. Ponder, S. Prahalad, O. T. Inan, and S. Abramowicz, “Acoustic Emissions Generated by the Temporomandibular Joint of Patients with Juvenile Idiopathic Arthritis and their Implication on Patient Assessment and Screening: A Pilot Study,” ACR/ARHP Annual Meeting, Chicago, IL, 2018. V. B. Aydemir, J. Fan, S. Dowling, O. T. Inan, J. M. Rehg, and L. Klein, “Ballistocardiography for Ambulatory Detection and Prediction of Heart Failure Decompensation,” Heart Failure Society of America Meeting, Nashville, TN, 2018. M. M. H. Shandhi, J. Fan, J. Alex Heller, M. Etemadi, O. T. Inan, and L. Klein, “Seismocardiography Can Assess Cardiopulmonary Exercise Test Parameters in Patients with Heart Failure,” Heart Failure Society of America Meeting, Nashville, TN, 2018. N. Z. Gurel, H. Jung, A. Hankus, S. L. Ladd, M. M. H. Shandhi, M. Huang, S. D. Rhodes, L. Shallenberger, B. D. Pearce, A. Shah, V. Vaccarino, O. T. Inan, J. D. Bremner, “Toward Wearable Sensing Enabled Closed-Loop Non-Invasive Vagus Nerve Stimulation: A Study of Real-Time Physiological Biomarkers,” North American Neuromodulation Society (NANS) Conference, New York, NY, 2018. N. B. Bolus, V. G. Ganti, and O. T. Inan, “A 3D-Printed, Adjustable-Stiffness Knee Brace with Embedded Magnetic Angle Sensor,” 40th Annual IEEE Engineering in Medicine and Biology Conference, Honolulu, HI, 2018. N. Z. Gurel, H.-K. Jeong, H. Kloefkorn, S. Hochman, and O. T. Inan, “Unobtrusive Heartbeat Detection from Mice Using Sensors Embedded in the Nest,” 40th Annual IEEE Engineering in Medicine and Biology Conference, Honolulu, HI, 2018. M. M. H. Shandhi, J. Fan, S. Dowling, O. T. Inan, and L. Klein, “Using Ballistocardiography Measurements to Assess Diuretic Effects in Patients with Heart Failure,” European Society of Cardiology Heart Failure Congress, Vienna, Austria, 2018. S. Hersek, S. Mabrouk, and O. T. Inan, “Wearable Electrical Bioimpedance for Detecting Joint Edema,” 40th Annual IEEE Engineering in Medicine and Biology Conference, Honolulu, HI, 2018. M. M. H. Shandhi, L. Klein, J. Fan, M. Etemadi, and O. T. Inan, “Longitudinal Ballistocardiogram and Electrocardiogram Measurements from Patients with Heart Failure at Home: Results from the Ongoing Studies and Lessons Learned,” 40th Annual IEEE Engineering in Medicine and Biology Conference, Honolulu, HI, 2018. A. M. Carek and O. T. Inan, “SeismoWatch 2.0: Wrist-Worn Sensing System for Pulse Transit Time Based Cuffless Blood Pressure Estimation,” 40th Annual IEEE Engineering in Medicine and Biology Conference, Honolulu, HI, 2018. C. Zhang, Q. Xue, A. Waghmare, R. Meng, S. Jain, Y. Han, X. Li, K. Cunefare, T. Ploetz, T. Starner, O. T. Inan, and G. D. Abowd, “FingerPing: Recognizing fine-grained hand poses using active acoustic on-body sensing,” Proceedings of the 2018 CHI Conference on Human Factors in Computing Systems (CHI ’18), Montreal, Canada, 2018. A. O. Bicen, and O. T. Inan, "A Signal Quality Index for Ballistocardiogram Recordings based on Electrocardiogram RR Intervals and Matched Filtering," in Proc. IEEE Biomedical and Health Informatics Conference (BHI), Las Vegas, NV, March 2018. T. Wehbe, V. J. Mooney, D. Keezer, O. T. Inan, A. Q. Javaid, and C. Kulkami, “Use of Analog Signatures for Hardware Trojan Detection,” FPGAWorld Conference, Stockholm, Sweden, 2017. M. M. H. Shandhi, S. Dowling, J. Fan, O. T. Inan, and L. Klein, “Use of Ballistocardiography can Monitor Hemodynamic Changes in Patients with Heart Failure,” International Society for Mechanical Circulatory Support (ISMCS) Conference, Tuscon, AZ, 2017. M. Baran Pouyan, L. B. Arroyo, M. Jammohamed, T. De Marco, G. M. Wieselthaler, V. N. Selby, O. T. Inan, and L. Klein, “Advanced Machine Learning Techniques for Sound Wave Analysis can Identify Ventricular Assist Device Thrombosis,” International Society for Mechanical Circulatory Support (ISMCS) Conference, Tuscon, AZ, 2017. C. Zhang, X. Wang, A. Waghmare, S. Jain, T. Ploetz, O. T. Inan, T. Starner, and G. Abowd, “FingOrbits: Interaction with Wearables using Synchronized Thumb Movements,” International Symposium on Wearable Computers (ISWC), Maui, HI, 2017. M. Baran Pouyan, S. Dowling, T. De Marco, L. Klein, and O. T. Inan, “Quantifying the Accuracy of Heart Failure Decompensation Classification using Wearable Seismocardiography and Graph Mining Algorithms,” Heart Failure Society of America Meeting, Dallas, TX, 2017. Z. Xia, M. M. H. Shandhi, O. T. Inan, and Y. Zang, “Interference and Removal of Respiration Harmonics on Noncontact Seismocardiogram Signals,” 11th International Workshop on Structural Health Monitoring, Stanford, CA, 2017. M. M. H. Shandhi, Z. Xia, O. T. Inan, and Y. Zhang, “Clutter Effect on the Noncontact Seismocardiogram Signals Measured Using Microwave Radars,” 11th International Workshop on Structural Health Monitoring, Stanford, CA, 2017. N. B. Bolus, C. N. Teague, G. F. Kogler, and O. T. Inan, “An Instrumented Ankle Foot Orthosis for Quantifying the Influence of Plantarflexion Resistance on Joint Kinematics in Healthy Individuals,” 41st Annual Meeting of the American Society of Biomechanics (ASB), Boulder, CO, 2017. H. Toreyin, A. Q. Javaid, and O. T. Inan, “Quantifying the Effects of Blood Pressure Changes on Ballistocardiogram Signals,” 25th Signal Processing and Communications Applications Conference (SIU), Antalya, Turkey, 2017. D. C. Whittingslow, B. Semiz, L. Ponders, A. D. Wiens, O. T. Inan, and S. Prahalad, "Analysis and Implications of Non-Invasive Knee Acoustical Emissions in Juvenile Idiopathic Arthritis: A Case Study," ACR / ARHP Pediatric Rheumatology Symposium, Houston, TX, 2017. M. Baran Pouyan, L. B. Arroyo, S. Hersek, M. Janmohamed, T. De Marco, G. M. Wieselthaler, V. N. Selby, O. T. Inan, and L. Klein, “Novel Techniques of Sound Wave Analysis Can Detect Ventricular Assist Device Thrombosis,” 37th Annual Meeting & Scientific Sessions of the International Society for Heart and Lung Transplantation (ISHLT), San Diego, CA, 2017. C.-S. Kim, S. L. O. Martin, A. M. Carek, H. Ashouri, O. T. Inan, R. Mukkamala, and J.-O. Hahn, “Unobtrusive Blood Pressure Monitoring via Pulse Transit Time: Ballistocardiogram-Based Approach,” 39th Annual IEEE Engineering in Medicine and Biology Conference, Jeju Island, Korea, 2017. H. Ashouri and O. T. Inan, “Investigating the effects of stance width on signal quality for standing head-to-foot ballistocardiogram measurements,” IEEE Biomedical and Health Informatics Conference (BHI), Orlando, FL, 2016. M. M. H. Shandhi, S. Hersek, and O. T. Inan, “A finite element model of knee electrical bioimpedance for facilitating edema quantification,” IEEE Biomedical and Health Informatics Conference (BHI), Orlando, FL, 2016. C. Zhang, A. Bedri, G. Reyes, B. Bercik, O. T. Inan, T. E. Starner, and G. Abowd, “TapSkin: Recognizing On-Skin Input for Smartwatches,” ACM International Conference on Interactive Surfaces and Spaces (ACM ISS), Niagara Falls, Canada, 2016. A. M. Carek, J. Conant, and O. T. Inan, “Live Demonstration: Pulse Transit Time Measurement on a Modified Weighing Scale for Cuffless Blood Pressure Estimation,” IEEE Sensors Conference, Orlando, FL, 2016. S. Shah, C. N. Teague, O. T. Inan, and J. Hasler, “A Proof-of-Concept Classifier for Acoustic Signals from the Knee Joint on a FPAA,” IEEE Sensors Conference, Orlando, FL, 2016. O. T. Inan, A. Dorier, S. Dowling, A. Q. Javaid, M. Etemadi, S. Roy, T. De Marco, and L. Klein, “Activity-Contextualized Wearable Ballistocardiogram Measurements can Classify Decompensated versus Compensated Heart Failure Patients,” American Heart Association (AHA) Scientific Sessions, New Orleans, LA, 2016. O. T. Inan, A. Q. Javaid, S. Dowling, H. Ashouri, M. Etemadi, J. A. Heller, S. Roy, and L. Klein, “Using Ballistocardiography to Monitor Left Ventricular Function in Heart Failure Patients,” Heart Failure Society of America Scientific Meeting, Orlando, FL, 2016. J. A. Jambulingam, R. McCrory, L. West, and O. T. Inan, “Non-Invasive, Multi-Modal Sensing Techniques for Detecting Infiltration during Intravenous Therapy,” 38th Annual IEEE Engineering in Medicine and Biology Conference, Orlando, FL, 2016. N. B. Bolus, G. F. Kogler, and O. T. Inan, “A Novel Method to Assess Angle Sensor Performance for Use in Wearable Joint Range of Motion Sensing,” 38th Annual IEEE Engineering in Medicine and Biology Conference, Orlando, FL, 2016. S. Shah, H. Toreyin, O. T. Inan, and J. Hasler, “Reconfigurable Analog Classifier For Knee-Joint Rehabilitation,” 38th Annual IEEE Engineering in Medicine and Biology Conference, Orlando, FL, 2016. H. Toreyin, H. K. Jeong, S. Hersek, C. N. Teague, and O. T. Inan, “Real-Time Activity-Classification in a Wearable System Prototype for Knee-Joint Health Assessment via Joint Sounds,” 38th Annual IEEE Engineering in Medicine and Biology Conference, Orlando, FL, 2016. A. M. Carek and O. T. Inan, “A Temperature-Controlled Glove with Non-Invasive Arterial Pulse Sensing for Active Neuro-Vascular Assessment,” 38th Annual IEEE Engineering in Medicine and Biology Conference, Orlando, FL, 2016. A. D. Wiens, S. Prahalad, and O. T. Inan, “VibroCV: A Computer Vision Based Vibroarthrography Platform with Possible Application to Juvenile Idiopathic Arthritis,” 38th Annual IEEE Engineering in Medicine and Biology Conference, Orlando, FL, 2016. A. Q. Javaid, S. Dowling, M. Etemadi, J. A. Heller, S. Roy, L. Klein, and O. T. Inan, “Quantification of Posture-Induced Changes in Wearable Ballistocardiogram Signals for Heart Failure Patients,” Computers in Cardiology, Vancouver, BC, Canada, 2016. R. Mukkamala, O. T. Inan, J.-O. Hahn, and L. K. Mestha, “Contact and Non-Contact Pulse Transit Time Measurement Systems for Cuff-Less Blood Pressure Tracking,” 38th Annual IEEE Engineering in Medicine and Biology Conference, Orlando, FL, 2016. O. T. Inan, A. Q. Javaid, S. Dowling, H. Ashouri, M. Etemadi, J. A. Heller, S. Roy, and L. Klein, “Wearable Ballistocardiogram Measurements during Six Minute Walk Tests for Heart Failure Patients,” 38th Annual IEEE Engineering in Medicine and Biology Conference, Orlando, FL, 2016. O. T. Inan, R. Mukkamala, and J.-O. Hahn, “Ballistocardiography as a Proximal Timing Reference for Pulse Transit Time: Measurement and Timing Detection Methods,” 38th Annual IEEE Engineering in Medicine and Biology Conference, Orlando, FL, 2016. Z. Xia, A. M. Carek, O. T. Inan, and Y. Zhang, “Comparison of Noncontact and Accelerometer Based Cardiogenic Chest Wall Movement Signals: A Preliminary Study,” 38th Annual IEEE Engineering in Medicine and Biology Conference, Orlando, FL, 2016. O. T. Inan, S. Hersek, C. N. Teague, H. Toreyin, H. K. Jeong, M. L. Jones, M. L. Millard-Stafford, G. F. Kogler, M. N. Sawka, “A stethoscope for the knee: Investigating joint acoustical emissions as novel biomarkers for wearable joint health assessment,” 171st meeting of the Acoustical Society of America, Salt Lake City, UT, 2016. O. Quesada, M. El Banani, J. Heller, S. Beach, M. Etemadi, S. Roy, O. T. Inan, J. Gonzalez, and L. Klein, “A Pilot Study of a Modified Bathroom Scale to Monitor Cardiovascular Hemodynamics in Pregnancy,” American College of Cardiology Meeting, Chicago, IL, 2016. M. Etemadi, M. A. Brooke, J. Alex Heller, S. Roy, O. T. Inan, and G. P. Victorino, “Wearable Hemodynamic Monitoring for Trauma Resuscitation,” IEEE Biomedical and Health Informatics Conference, Las Vegas, NV, 2016. C. Wick, J. Yao, P. Bhatti, O. T. Inan, and S. Tridandapani, “Dynamic Time Warping for Heart-Rate-Independent Timing of Cardiac Phases,” IEEE Biomedical and Health Informatics Conference, Las Vegas, NV, 2016. A. Q. Javaid, H. Ashouri, and O. T. Inan, “Estimating Systolic Time Intervals During Walking Using Wearable Ballistocardiography,” IEEE Biomedical and Health Informatics Conference, Las Vegas, NV, 2016. H. Ashouri and O. T. Inan, “Improving the Accuracy of Proximal Timing Detection from Ballistocardiogram Signals using a High Bandwidth Force Plate,” IEEE Biomedical and Health Informatics Conference, Las Vegas, NV, 2016. H. Toreyin, A. Q. Javaid, H. Ashouri, O. Ode, and O. T. Inan, “Towards Ubiquitous Blood Pressure Monitoring in an Armband using Pulse Transit Time,” IEEE Biomedical Circuits and Systems (BioCAS) Conference¸Atlanta, GA, 2015. H. Toreyin, C. N. Teague, S. Hersek, M. L. Millard-Stafford, M. L. Jones, G. F. Kogler, M. N. Sawka, and O. T. Inan, "A Wearable System for Activity-Contextualized Knee-Joint Health Assessment via Acoustic Emissions," NIH IEEE Point-of-Care-Technologies Conference, Bethesda, MD, 2015. A. M. Carek, H. Toreyin, S. Hersek, and O. T. Inan, “Preliminary Methods for Wearable Neuro-Vascular Assessment with Non-Invasive, Active Sensing,” 37th Annual IEEE Engineering in Medicine and Biology Conference, Milan, Italy, 2015. C. A. Wick, O. T. Inan, and S. Tridandapani, “Cardiac Quiescence from Seismocardiography and Echocardiography,” 37th Annual IEEE Engineering in Medicine and Biology Conference, Milan, Italy, 2015. A. D. Wiens and O. T. Inan, “Accelerometer Body Sensor Network Improves Systolic Time Interval Assessment with Wearable Ballistocardiography,” 37th Annual IEEE Engineering in Medicine and Biology Conference, Milan, Italy, 2015. C. McCall, R. Rostosky, R. M. Wiard, O. T. Inan, L. Giovangrandi, C. M. Cuttino, and G. T. A. Kovacs, “Noninvasive Pulse Transit Time Measurement for Arterial Stiffness Monitoring in Microgravity,” 37th Annual IEEE Engineering in Medicine and Biology Conference, Milan, Italy, 2015. C.-S. Kim, A. M. Carek, R. Mukkamala, O. T. Inan, and J.-O. Hahn, “Ballistocardiogram as a Proximal Timing Reference for Pulse Transit Time Measurement: Potential for Cuffless Blood Pressure Monitoring,” MedicalCPS, 2015. A. D. Wiens, A. Carek, and O. T. Inan, “Sternal vibrations reflect hemodynamic changes during immersion: Underwater ballistocardiography,” 169th Meeting of the Acoustical Society of America, Pittsburgh, PA, 2015. O. T. Inan and A. Wiens, “Early Findings Exploring the Possibility of Combining Ballistocardiogram and Plethysmographic Measures from the Hand,” 36th Annual IEEE Engineering in Medicine and Biology Conference, Chicago, IL, 2014. K. Pandia, O. T. Inan, and G. T. A. Kovacs, “A Frequency Domain Analysis of Respiratory Variations in the Seismocardiogram Signal,” 35th Annual IEEE Engineering in Medicine and Biology Conference, Osaka, Japan, 2013. D. Park, O. T. Inan, and L. Giovangrandi, "A Combined Heartbeat Detector based on Individual BCG and IPG Heartbeat Detectors," 34th Annual IEEE Engineering in Medicine and Biology Conference, San Diego, CA, 2012. L. Giovangrandi, O. T. Inan, R. M. Wiard, M. Etemadi, and G. T. A. Kovacs, "Ballistocardiography—A Method Worth Revisiting," 33rd Annual IEEE Engineering in Medicine and Biology Conference, Boston, MA, 2011. O. T. Inan, D. Park, G. T. A. Kovacs, and L. Giovangrandi, "Multi-Signal Electromechanical Cardiovascular Monitoring on a Modified Home Bathroom Scale," 33rd Annual IEEE Engineering in Medicine and Biology Conference, Boston, MA, 2011. O. T. Inan, O. Marcu, M. E. Sanchez, S. Bhattacharya, L. Giovangrandi, and G. T. A. Kovacs, "Innovative Methods for Enabling Automatic Analysis of Drosophila Behavioral Activity in Space and Terrestrial Settings," IBE 2009, Santa Clara, CA. M. Etemadi, O. T. Inan, R. M. Wiard, L. Giovangrandi, and G. T. A. Kovacs, "Non-Invasive Assessment of Cardiac Contractility on a Weighing Scale," 31st Annual IEEE Engineering in Medicine and Biology Conference, Minneapolis, MN, 2009. O. T. Inan, M. Etemadi, R. M. Wiard, G. T. A. Kovacs, and L. Giovangrandi, "Novel Methods for Estimating the Ballistocardiogram Signal Using a Simultaneously Acquired Electrocardiogram," 31st Annual IEEE Engineering in Medicine and Biology Conference, Minneapolis, MN, 2009. O. T. Inan, M. Etemadi, R. M. Wiard, L. Giovangrandi, and G. T. A. Kovacs, "Non-Invasive Cardiac Output Trending During Exercise Recovery on a Home Bathroom Scale," Athlete's Heart, Sudden Death & Hypertrophic Cardiomyopathy Conference, Stanford, CA, 2009. M. Etemadi, O. T. Inan, R. M. Wiard, L. Giovangrandi, and G. T. A. Kovacs, "Non-invasive Assessment of Valsalva-Induced Hemodynamic Changes on a Home Bathroom Scale," Athlete's Heart, Sudden Death & Hypertrophic Cardiomyopathy Conference, Stanford, CA, 2009. O. T. Inan, M. Etemadi, R. M. Wiard, L. Giovangrandi, and G. T. A. Kovacs, "Evaluating the Foot Electromyogram Signal as a Noise Reference for Bathroom-Scale Ballistocardiogram Recording," 21st Annual IEEE International Symposium on Computer Based Medical Systems, Jyväskylä, Finland, 2008. O. T. Inan, M. Etemadi, R. M. Wiard, G. T. A. Kovacs, and L. Giovangrandi, "Non-Invasive Monitoring of Valsalva-Induced Hemodynamic Changes Using a Bathroom Scale Ballistocardiograph," 30th Annual IEEE Engineering in Medicine and Biology Conference, Vancouver, B.C., 2008. 1. A. Ozcan, O. T. Inan, N. I. Maluf, G. T. A. Kovacs, M. J. F. Digonnet, G. S. Kino, "Alternative data-processing methods for frequency domain OCT," 2006 IEEE Conference on Lasers and Electro-Optics. O. T. Inan, M. Etemadi, R. M. Wiard, L. Giovangrandi, and G. T. A. Kovacs, “Systems and Methods for Monitoring Heart Function,” US Patents 8,858,449 and 8,870,780, Issued in 2014. K. Pandia, O. T. Inan, and L. Giovangrandi, “Methods and System of Determining Cardio-Respiratory Parameters,” US Patent Application 20110021928, Filed July, 2010 by Stanford University. L. Giovangrandi, O. T. Inan, B. Dura, and M. Q. Chen, “Control of Cardiac Excitability Using High Frequency Signals,” US Patent Application 20140228837, Filed October, 2011 by Stanford University. O. T. Inan and A. D. Wiens, “A Novel System Identification Technique for Improved Wearable Hemodynamics Assessment,” US Provisional Patent Application, Filed August 25, 2014 by Georgia Institute of Technology.